Happy Valentine’s Day! I’m usually not a big Valentine’s Day person and like to take it easy on this day. I think from here on out I will use Valentine’s Day as an excuse to bake something fun and festive, which I did this time around. 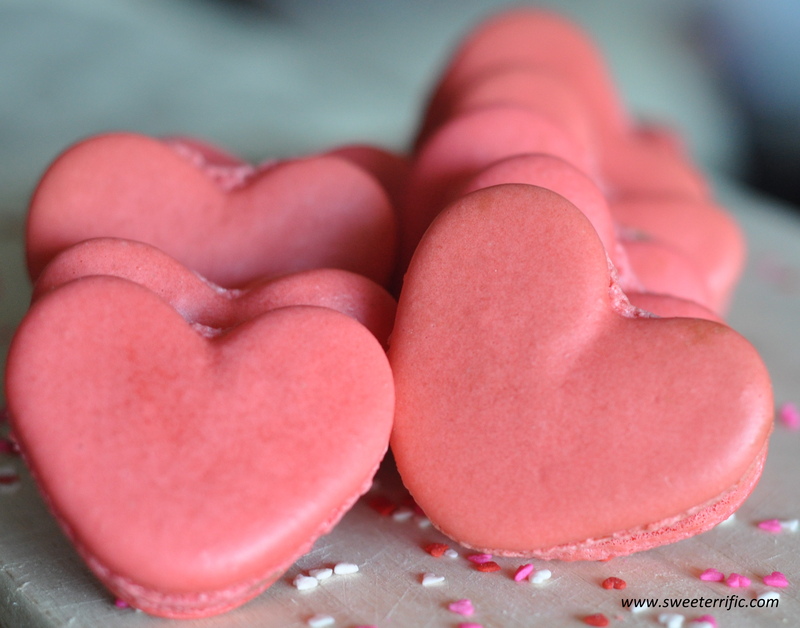 I couldn’t resist making heart-shaped macarons. 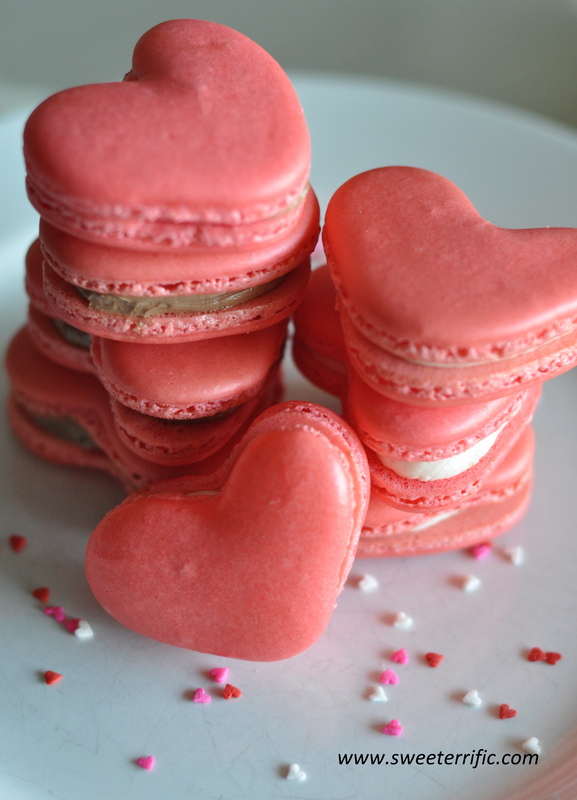 Besides, when else do you see macarons shaped like a heart? At first I was a little hesitant because I wondered if the batter will hold the shape once they were piped, but sure enough, it did! 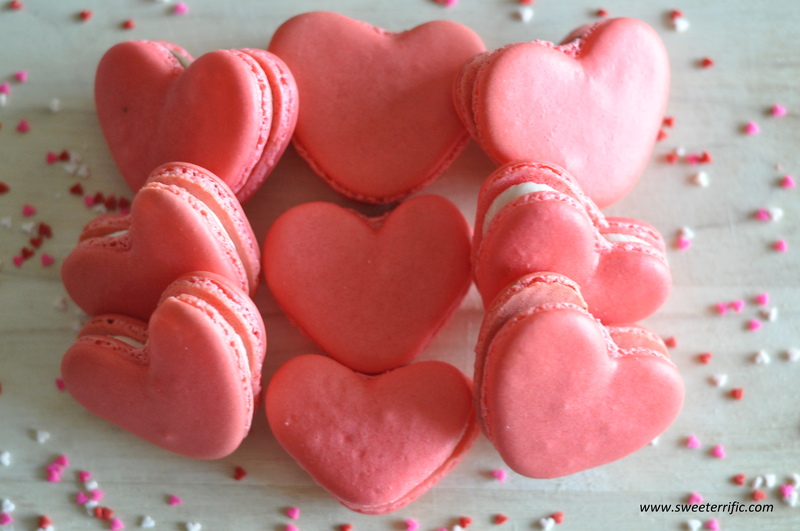 I didn’t use any templates for the hearts, which might have been easier to get consistent sizes of macarons. Instead, I carefully piped the hearts free-handed. Believe it or not, the fun part was trying to match up the hearts when it came time to sandwiching them. I filled half the macarons with strawberry buttercream, which I had leftover from the dinosaur cake and the other half with chocolate buttercream. The chocolate buttercream was easy to make. I saved some of the plain buttercream from the dinosaur cake and added melted dark chocolate. If you are short on time, another option is filling the macarons with raspberry or strawberry jam. Hope your day is filled with love, chocolates, and plenty of sweets! Happy Valentine’s Day! In a mixer bowl, whisk egg whites on medium speed. Once the whites become foamy, add a pinch of cream of tartar. Whisk on high-speed to incorporate. Slowly stream in granulated sugar. Continue to whisk until whites reach a medium peak. At this time, add food coloring and whisk to incorporate. Add as much or as little food coloring to get desired color. Fold in the dry ingredients in three additions and carefully fold with a spatula to incorporate each time. Once all the dry ingredients have been incorporated with the meringue, transfer batter to a piping bag with a round tip (I used an Ateco 803 tip). Pipe heart shapes on parchment lined sheet pans. Tap sheet pan against counter to remove any air bubbles. Allow macarons to rest 1 hour before baking. Bake at 310F for 10-12 minutes. 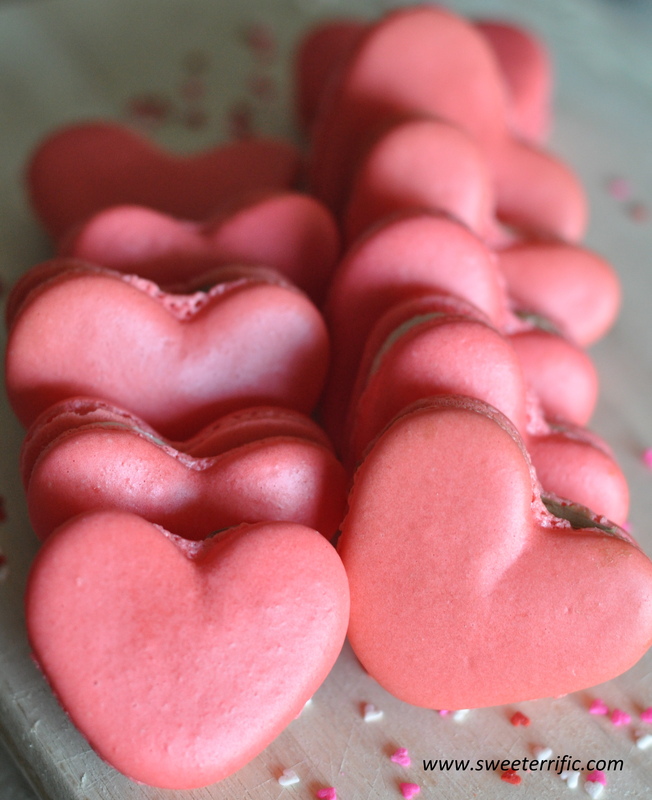 Once cooled, fill macarons with buttercream.